MASON, Ohio — The top seeds at the Western & Southern Open waited hours through rain before their matches were postponed late Thursday night, setting up a chaotic weekend finish. Defending champion Karolina Pliskova was up 3-0 in the first set against Camila Giorgi when steady rain moved in and the match was called more than two hours later. Rafael Nadal, the top seed in the men's bracket, never took the court. Both face the prospect of a long day Friday — an early afternoon match and, if they win, another at night. Three long delays and several shorter ones Thursday kept players waiting. 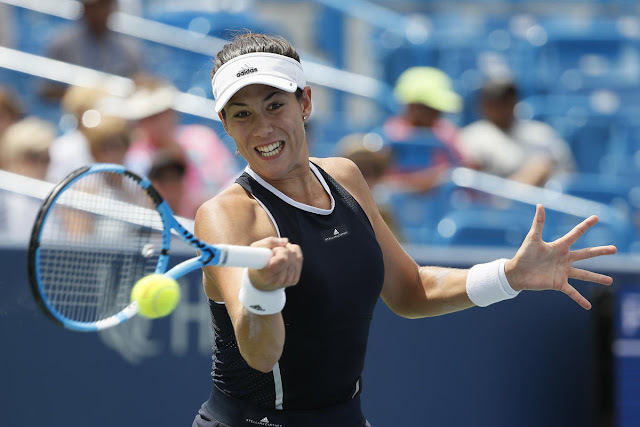 Wimbledon champion Garbine Muguruza overcame a long rain delay in the third set and fought off three match points before advancing to the quarterfinals. The tournament's No. 4 seed beat American Madison Keys 6-4, 3-6, 7-6 (3) to extend her successful summer. Since beating Venus Williams for the Wimbledon title, she has reached the quarterfinals of her last three tournaments. The third set was tied 2-2 when the first storm moved through the area in the afternoon, causing a nearly two-hour delay. After play resumed, Keys got ahead 6-5 and was serving for the match at 40-15 but hit a couple of balls into the net. She wasted another match point before Muguruza took it to the tiebreaker and dominated. Muguruza grew up near Barcelona and learned about the attack in the Las Ramblas district during the rain delay. She contacted relatives to make sure they were fine. "I have been so many times to this place, it's like my home," she said. "So it really shocked me." Keys wasn't able to make the one final shot to win it at the end. "I obviously had some unforced errors that I wasn't happy about, but I felt like I had to go for it because she was just going to make everything," Keys said. Second-seeded Simona Halep became the tournament's first quarterfinalist with a 6-4, 6-3 win over 15th-seeded Anastasija Sevastova. The straight-set win was her second in two matches. "I'm not playing my best tennis, but winning when I'm not playing good is a plus for me," Halep said. "I'm really happy about it." It's the fifth straight year that Halep, No. 2 in the rankings, has at least reached the Cincinnati quarterfinals. She was runner-up to Serena Williams in 2015. In the men's bracket, Grigor Dimitrov rallied from a 4-1 second-set deficit for a 6-3, 7-5 win over Juan Martin del Potro. The seventh-seeded Dimitrov got his first career win in six matches against Del Potro. John Isner beat Frances Tiafoe 7-6 (4), 7-5 in an afternoon match delayed twice by rain. The second set was tied 4-4 when the match was halted for an hour. It was tied 5-5 when there was another 10-minute delay. When play resumed, Tiafoe double-faulted to help Isner close it out. "I actually didn't mind that rain delay at all," Isner said of the longer break. "I went in the locker room, showered, changed, stretched, ate a little. I was very refreshed coming back out there to finish the match."